Students, faculty, and other members of the MIT community gathered on Killian Court Wednesday to reflect upon Tuesday’s tragedies in New York, at the Pentagon, and in Pennsylvania. The poster, which was put up by MIT’s chapter of Refuse and Resist, was torn down by a local construction worker, said Anton Van Der Ven, a postdoctoral associate actively involved in the group. 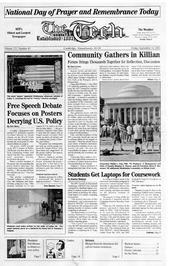 The MIT Council on Educational Technology (MITCET) has initiated a program to distribute laptop computers to students as part of an experiment aimed at assessing the educational impact of a mobile computing environment. Dean for Student Life Larry G. Benedict announced that Kathleen C. Wallace of Duke University will conduct a review of MIT’s actions regarding a harassment complaint filed by the late Julia M. Carpenter ’03 against Charvak P. Karpe ’04. The group actively takes part in a national effort to provide access to the latest technology to the needy. Activities range from teaching disadvantaged families to refurbishing computers. The group also sends student volunteers to various health centers and non-profit organization to help with their computer systems. MIT’s Center for International Studies held an open forum on Wednesday evening in an effort to help the community understand some of the possible international and societal consequences of Tuesday’s events.